Kaisen Misakiko is sushi go round restaurant, famous for its big fresh seasonal sushi. At this shop you can experience eating many different kinds of sushi! If you are traveling to Tokyo, come visit Kaisen Misakiko located in Ningyocho, Tokyo. Only a 2-5 minute walk from Ningyocho Station. In this article I will introduce you to this delicious sushi train/belt restaurant. If you are traveling to Tokyo, visit Kaisen Misakiko which is a sushi chain restaurant in Tokyo. We went to eat at one of their branches in Ningyocho which is considered famous among locals eating sushi for lunch and or dinner. While eating at this restaurant, there will be a tablet for you to select the sushi dish that you want. Of course English language option is available if you can’t read Japanese. This sushi conveyor belt serves many different kinds of sushi from tuna, salmon, all the way to scallops. 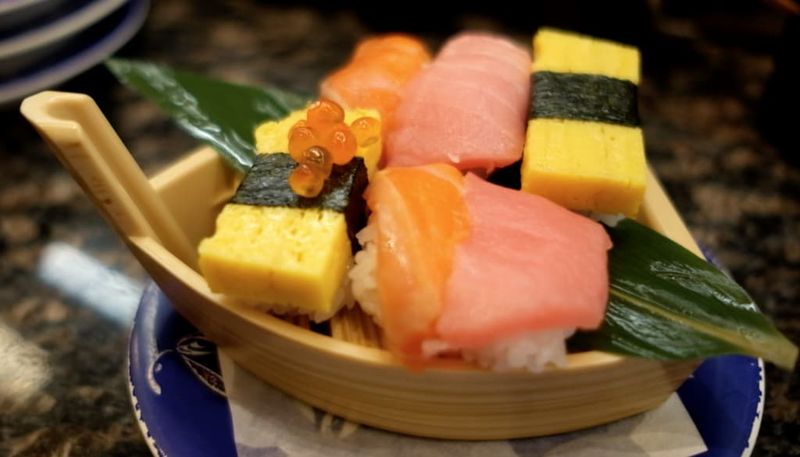 When you are eating here, you will surely love the variety of sushi they have to offer. If you use the tablet to order, your sushi will arrive via the train. If it is your first time experiencing a sushi train, you will surely love the unique atmosphere this restaurant has to offer. The price of sushi vary according to the color of the plate. For example if you get a red colored plate, that is usually the cheapest price(around 100 yen). The more expensive the dish, the more impactful flavor you will taste when eating sushi. Stack up those dishes and have a unforgettable sushi experience on your trip. Looking for Unique Tours in Japan? Check out our DayTrips for some unforgettable experiences we know you will enjoy and love. Things to see in Japan. AMAZING amounts of beckoning cats in Gotokuji Temple!! !